When we first learned about intuitive eating, we have to admit, we were a bit skeptical. It sounded a little bit woo-woo, and to be frank, we didn’t think it was a practical style of eating that worked for everyone. After countless hours of training in intuitive eating, however, we learned to embrace this nutrition philosophy. Research shows that most people who diet to lose weight gain it back (most of them gaining more than they originally lost). Research also supports intuitive eating as a way to make peace with food and even improve your health in the process. Since learning more, we have incorporated intuitive eating into our nutrition counseling and it’s led to better outcomes for our patients. We’ve shifted our focus to improving peoples thoughts and behaviors around food, without desperately trying to manipulate their body size. 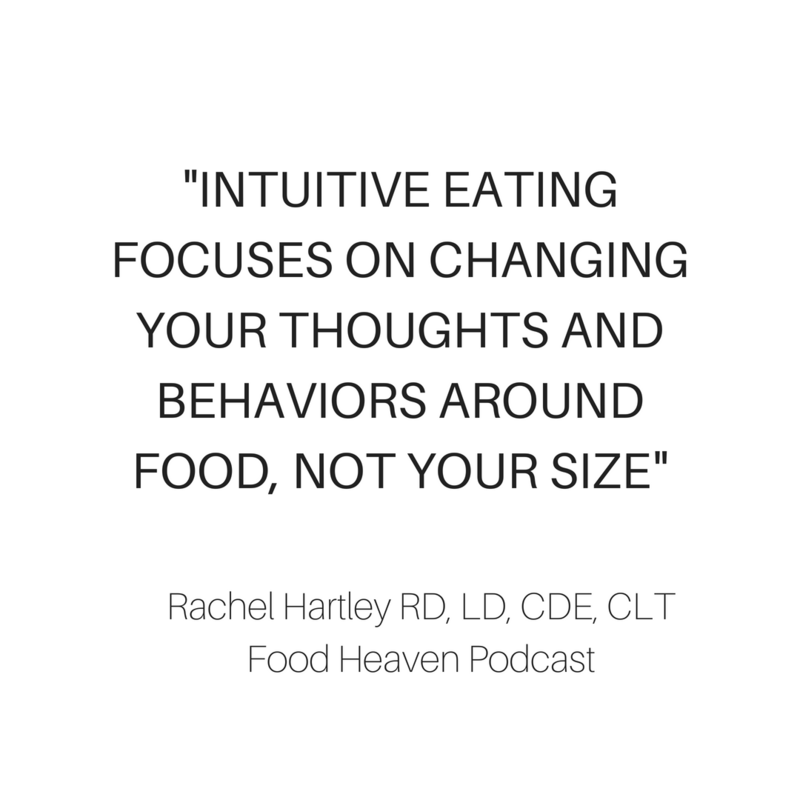 This week on the podcast, we brought in intuitive eating expert Rachael Hartley. She’s a registered dietitian rockstar and will leave you with so much knowledge on how to use intuitive eating to change your life. Rachael Hartley, RD, LD, CDE, CLT is a Columbia, SC-based private practice nutrition therapist and blogger at The Joy of Eating. After completing her dietetic internship at Emory University, she worked as a clinical dietitian and, later, as the outpatient dietitian for a large medical center where she provided individual nutrition counseling and led multidisciplinary disease management programs. In 2014, Rachael opened her private practice, where she specializes in intuitive eating, disordered eating, and digestive disorders. She is active in her field, currently serving as the president-elect for her local dietetics association and as the newsletter editor for the Nutrition Entrepreneurs dietetic practice group.